Kiefer Ravena reacted on the 'One Big Flop' chants of the University of the East (UE) crowds during their game last Wednesday, August 20. The game was Red Warriors against the Blue Eagles on second-round of UAAP. Blue Eagles win the game with the score 78-73 as Ravena do the three-points shot on the last 14 seconds of the last quarter that makes the UE gallery mute. According to Abs-cbn news interview, Ravena said that he was motivated to win the game due to Ateneo's cheers of "One Big Fight" as a support for them even though UE's chants were "One Clean Fight," and even chanting "One Big Flop" towards him. According to Wikipedia, a flop is an intentional fall by a basketball player after little or no physical contact by an opposing player in order to draw a personal foul call by an official against the opponent. Furthermore, flopping is sometimes called acting as if he was fouled even though it was not and it is widely practiced and even perfected by many professional players but, generally considered to be unsportsmanlike. Here was the response of Kiefer Ravena about the accusations of flopping on the game. Extra motivation, I guess that's the way to treat it, But it's also nice to hear the Ateneans backing me up. 'Yun 'yung mas angat sa cheer nila. "Hindi ko alam kung bakit ako 'yung associated with flopping. Siguro naiinis lang sila kasi nagugulangan ko sila," he said. "I guess that's part of the game... It's not only me who's doing it, ako lang siguro 'yung associated with it," he added. 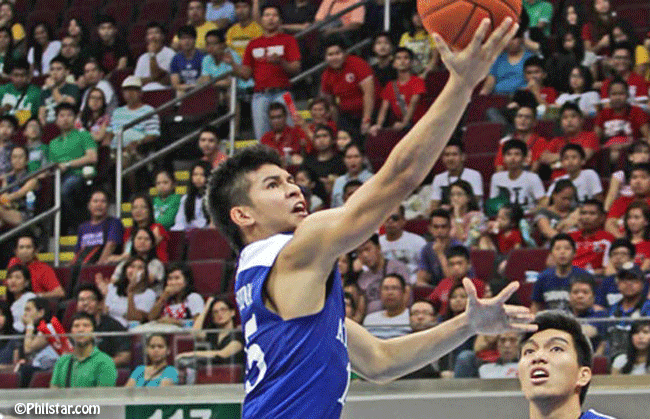 Kiefer Isaac Crisologo Ravena or popularly known as Kiefer Ravena is a Filipino amateur basketball player. He was born on October 27, 1993 in Iloilo, Philippines. Kiefer’s height is 6”0’ and he is weighing 195 lbs. He finished his high school education in Ateneo de Manila High School and is taking up Bachelor of Science in Communications Technology Mangaement at the Ateneo de Manila University. Kiefer’s current issue nowadays is with regards to the photo that spread about a girl named Kayla Leviste who allegedly made a dirty finger on a photo she uploaded on her social networking account. The photo became viral up to the point that Kayla was able to say sorry to Kiefer. Kiefer accepted her apology.